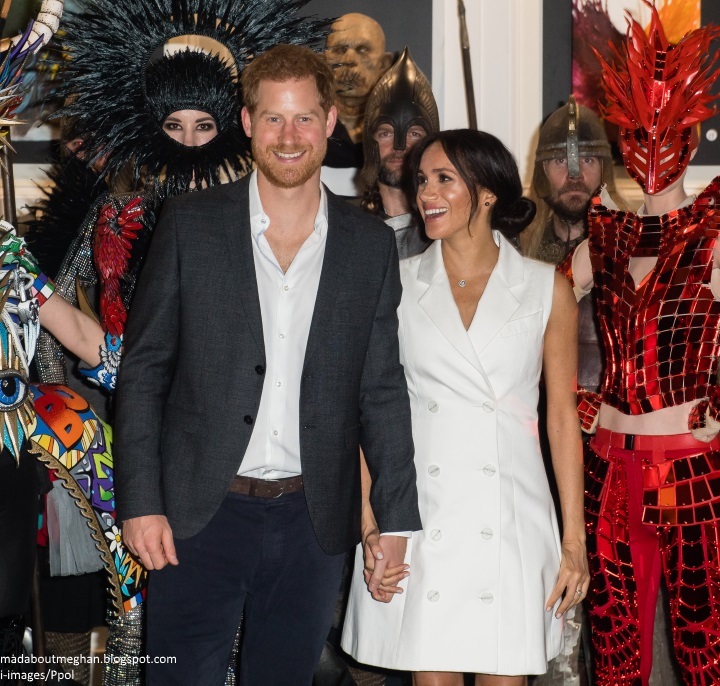 Mad About Meghan: Year in Review 2018, Part One: The Commonwealth Couple! Year in Review 2018, Part One: The Commonwealth Couple! Hello and welcome to our very first Year in Review post on Mad About Meghan. 2018 was an unforgettable year for Harry and Meghan, from pre-wedding engagements to the wedding itself, the launch of Together and the announcement the couple are expecting their first child, last year could be described as an embarrassment of riches for royal watchers. I've elected to divide the review into two posts, the first will focus specifically on the Sussexes' budding roles as Commonwealth ambassadors at home in the UK over the year, leading to their first overseas tour together. Since the engagement interview, it was clear Harry and Meghan were interested in devoting a portion of their working lives to the Commonwealth. I imagine this was discussed at length with senior members of the family and courtiers over the months that followed. The Queen, who celebrates her 93rd birthday in April, no longer undertakes overseas tours. With Charles taking on increasing responsibility in addition to his already endless portfolio, I had long anticipated we would see increasing responsibility passed to the young members of the family abroad. 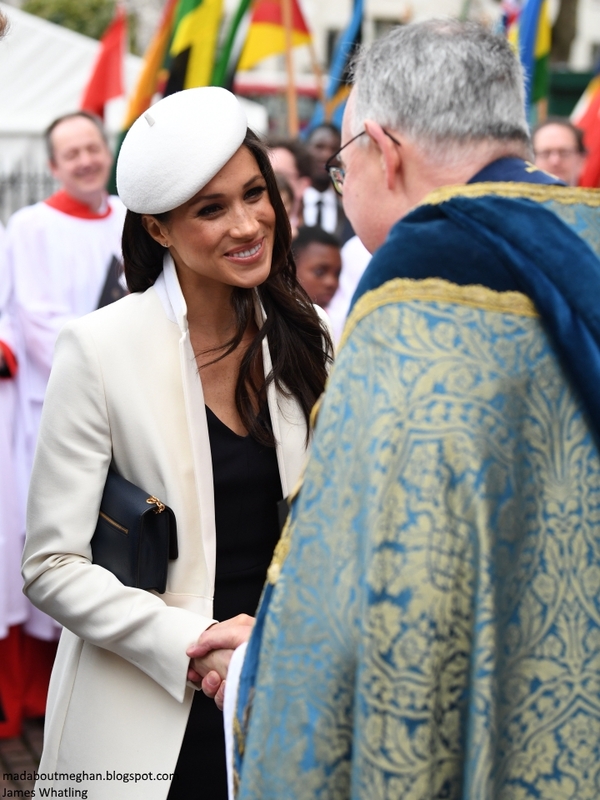 In March, the then Meghan Markle attended the Commonwealth Day Service. Not only did the event mark her most formal appearance to date, it was also the first she made with the Queen in attendance. The Duchess wore a cream sculpted coat and navy dress by Amanda Wakeley for the occasion. April brought one of the most important events on the 2018 royal calendar - the Commonwealth Heads of Government Meeting. The Royal family were out in force as leaders from all member countries gathered in London and Windsor to reaffirm common values, address the shared global challenges faced, and agree how to work to create a better future. 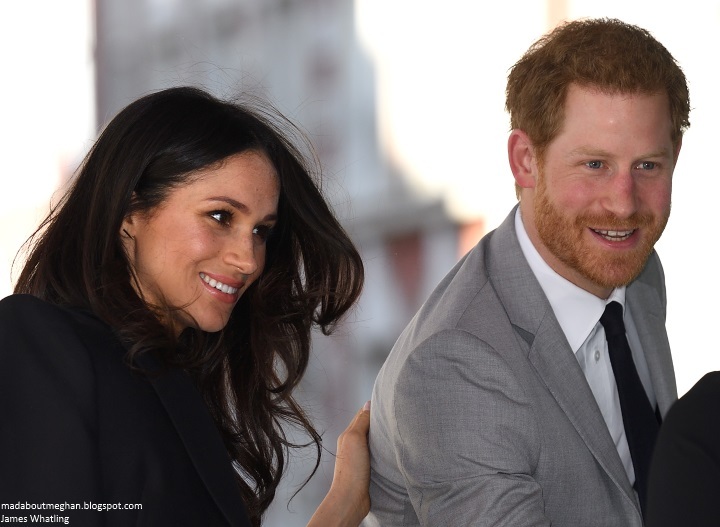 Meghan's participation was described as "unprecedented" by veteran royal reporters, who revealed it was "highly unusual" for fiancés to take part in events of such magnitude pre-wedding. Meghan spoke to LGBTI campaigners at length telling a group: "This is a basic human rights issue, not one about sexuality." The event coincided with news Prince Harry had become patron of the Queen's Commonwealth Trust. The new youth charity, of which Her Majesty is also patron, provides a platform for young change-makers across the Commonwealth in the areas of education, sport, health and the environment. During a speech, Harry announced it would be a job share with Meghan saying he was "incredible grateful the woman I am about to marry" would be joining him in the role. 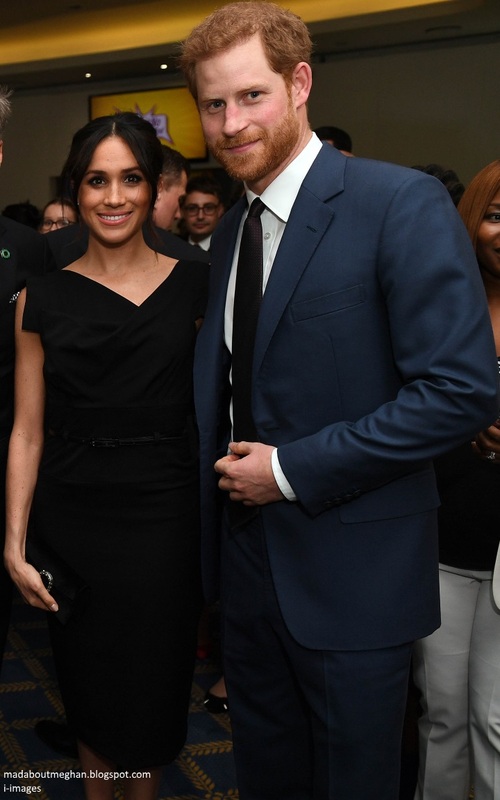 The following evening Harry and Meghan attended a CHOGM Women's Empowerment reception at the Royal Aeronautical Society. Meghan spoke with schoolgirls from Kenya about the ripple effect of empowering young women and the positive effect it has on the next generation in the community. 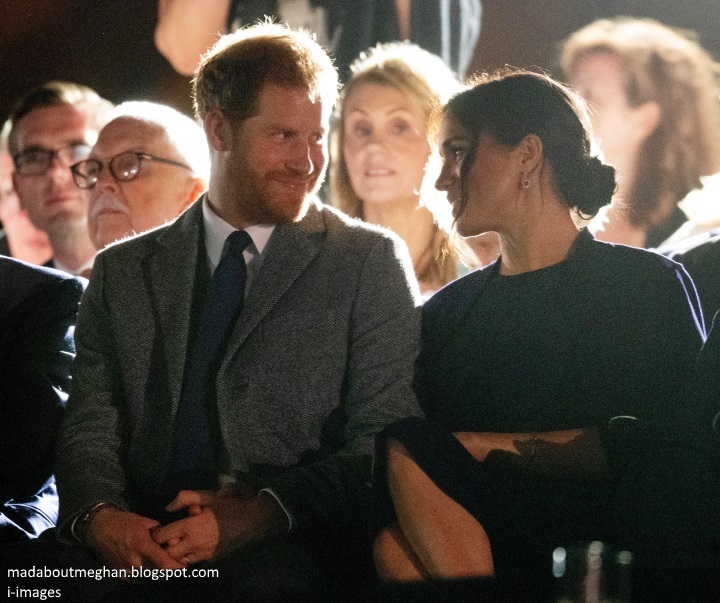 Meghan chose the effortlessly chic Black Halo Jackie O dress for the evening. 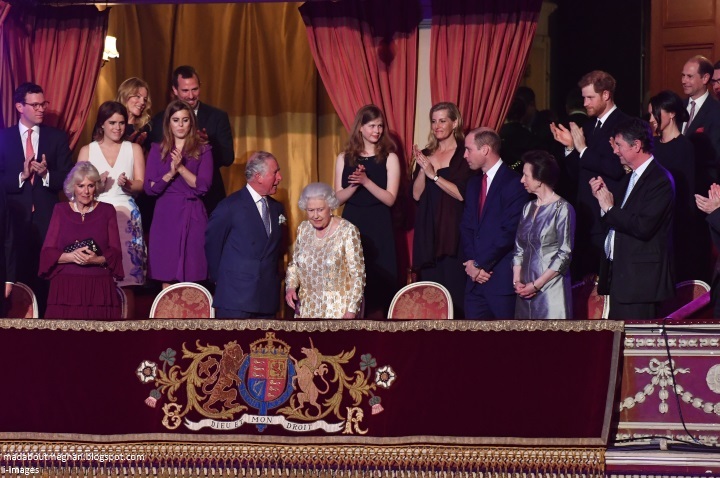 On Her Majesty's 92nd birthday, members of the British Royal family gathered at the Royal Albert Hall for the Queen's Birthday Party - a night of music, song and celebration. The event came at the end of CHOGM and followed the good news Charles would succeed his mother as Head of the Commonwealth. The Queen's Commonwealth Trust was the major beneficiary of the concert. 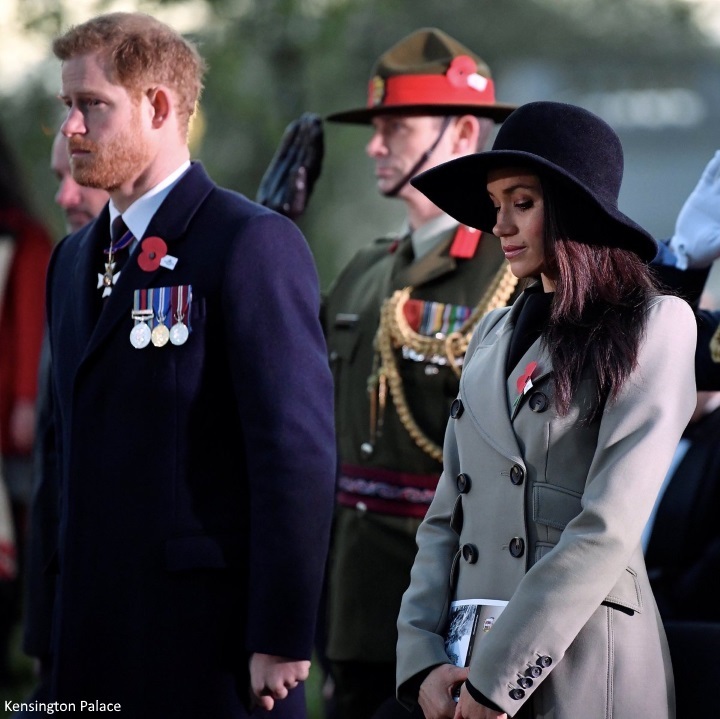 Meghan honoured Australia's and New Zealand's war dead on ANZAC Day at the Dawn Service at Wellington Arch. Anzac Day has been commemorated in London since the first anniversary of the Anzac landings at Gallipoli in 1916, when King George V attended a service at Westminster Abbey and more than 2,000 Australian and New Zealand troops marched through the streets. Since then, the services have become an important time to recognise the Australian and New Zealand Army Corps who died during the landings. Later that morning, Harry and Meghan joined William at Westminster Abbey for the Anzac Day Service of Commemoration and Thanksgiving. Meghan chose an elegant bespoke Emilia Wickstead ensemble. Back from their honeymoon, the Duke and Duchess of Sussex joined the Queen at Buckingham Palace for the Queen's Young Leaders Awards. The goal of the programme is to enable young people across the Commonwealth to step up as leaders in their communities. The Duchess wore a Prada outfit for the evening. 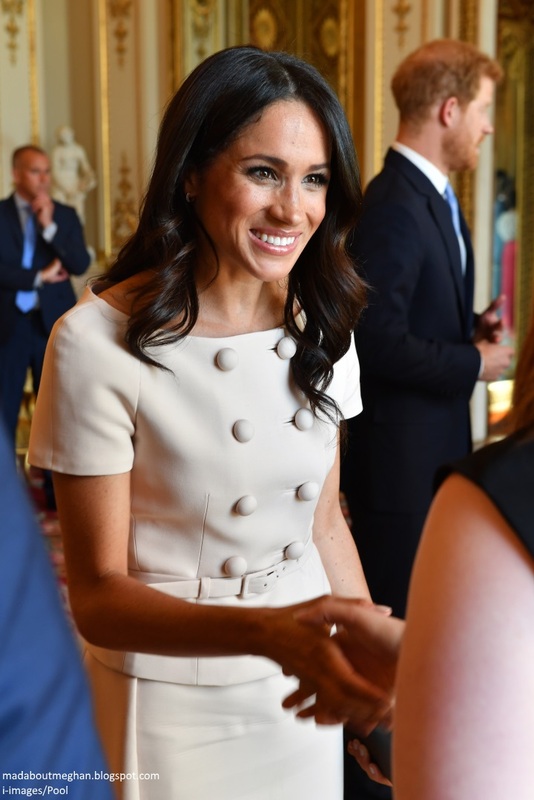 Meghan made a splash in a summery Brandon Maxwell dress for the 'Your Commonwealth' Youth Challenge Reception. Meghan made her first appearance in a royal documentary in September for Queen of the World, celebrating the Queen's life of service in the Commonwealth. 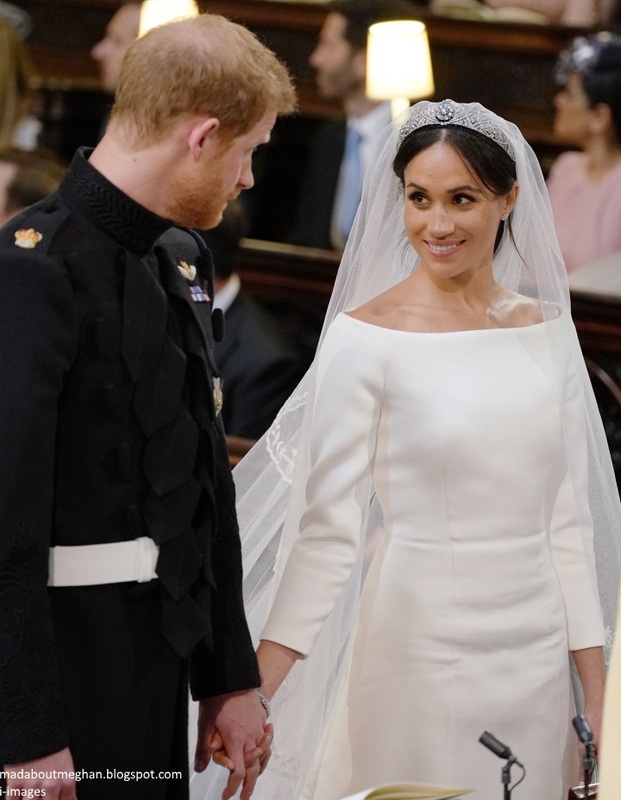 Meghan was featured several times throughout as she was reunited with her wedding dress. She discussed the significance of the Commonwealth and the importance of the "spirit of inclusivity" throughout the day. Her decision to incorporate flora from fifty-three countries was a special surprise for Harry on the day. "It was important for me, especially now being a part of the Royal family, to have all fifty-three of the Commonwealth countries incorporated, and I knew that it would be a fun surprise as well for my now husband, who didn’t know, and he was really over the moon to find out that I would make this choice for our day together. And I think the other members of the family had a similar reaction, and just appreciation for the fact that we understand how important this is for us and the role that we play, and the work that we’re going to continue to do within the Commonwealth countries." Meghan added: "You know, it’s such an exciting time for us, especially with Harry’s role as Youth Ambassador for the Commonwealth and the travel that we intend to do, to do work specifically in all those different territories. Which is why it was so important to have some sort of example of that present with us on the day, fifty-three countries as well, my goodness, It’ll keep us busy." October saw the Sussexes undertake their first joint Commonwealth tour. Coinciding with the Invictus Games, they decided to visit Australia, Fiji, Tonga and New Zealand. They were both said to be eager to pack as much as possible into the sixteen-day tour. Just twelve hours before their first engagement, the Palace confirmed the delightful news the couple were expecting their first child. The expectant parents were all smiles as they arrived for an Invictus Reception at Admiralty House. 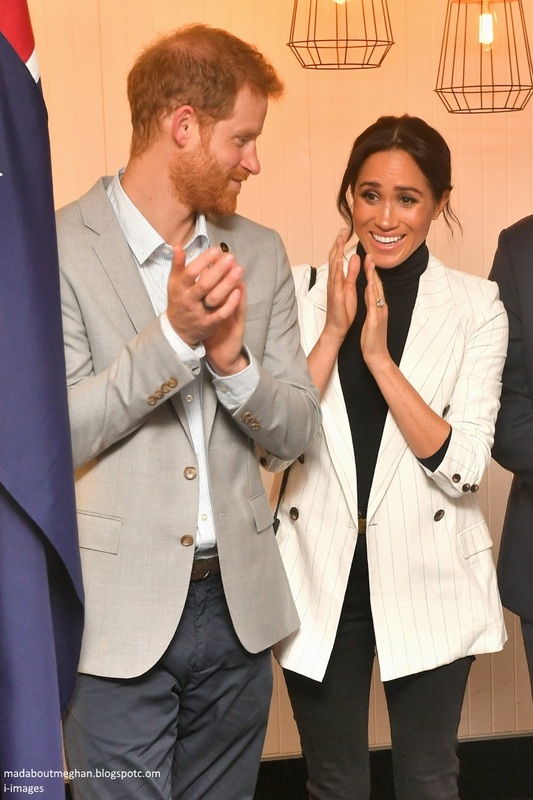 Meghan championed a host of Australian designers throughout the tour beginning with a structured Karen Gee dress and Martin Grant trench. Meghan revealed she was "excited" to join the parenting club for a reception at Admiralty House. Meghan wore a green Brandon Maxwell pleated shirtdress and accessorised with Diana's jewel encrusted gold butterfly earrings and gold bracelet. 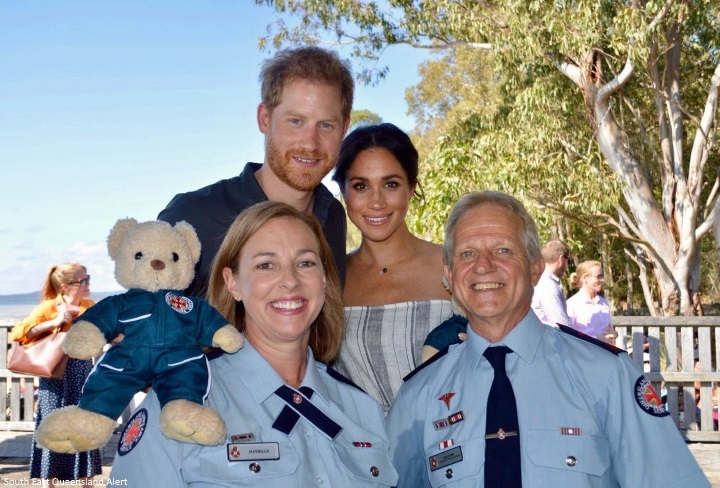 Day Two of the Sussexes' Royal Tour of Australia saw the Duke and Duchess fly to the town of Dubbo. The visit was the result of a hard-won pitch by the local council who knew the global coverage and potential tourism could prove a substantial coup for the area. Dubbo had been battling against an unprecedented drought which crippled residents. The couple saw first-hand the hardships local farmers faced when they met the Woodley family. In an incredibly thoughtful gesture, Meghan brought banana bread she baked at Admiralty House the previous night and Fortnum & Mason Royal Blend tea. A Palace aide said: "She loves baking and just decided to take something along with her on the spur of the moment." The gesture of kindness was greatly appreciated and offered an insight into the level of thought and consideration Meghan gave each one of these engagements. 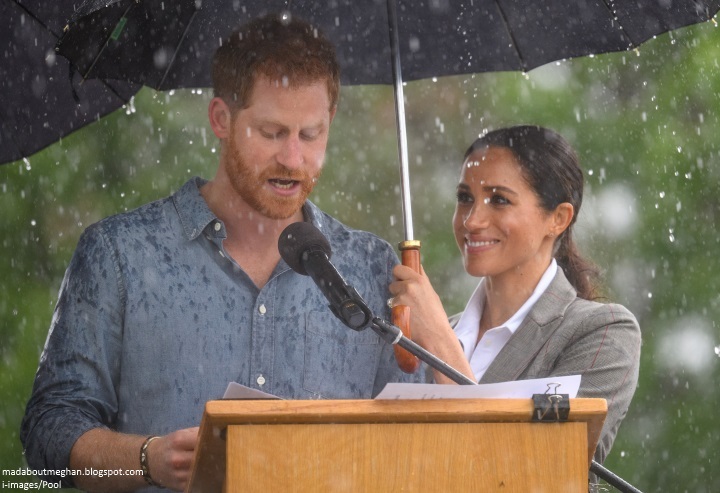 My favourite photo from the day showed Meghan holding an umbrella over Harry as he delivered a passionate speech. Royal media descended on Melbourne for day three. The size and enthusiasm of the crowds each step of the way was a sight to behold. I remember one little boy in particular from that day. Gavin woke up "with a cough" and quite simply had to stay at home from school. 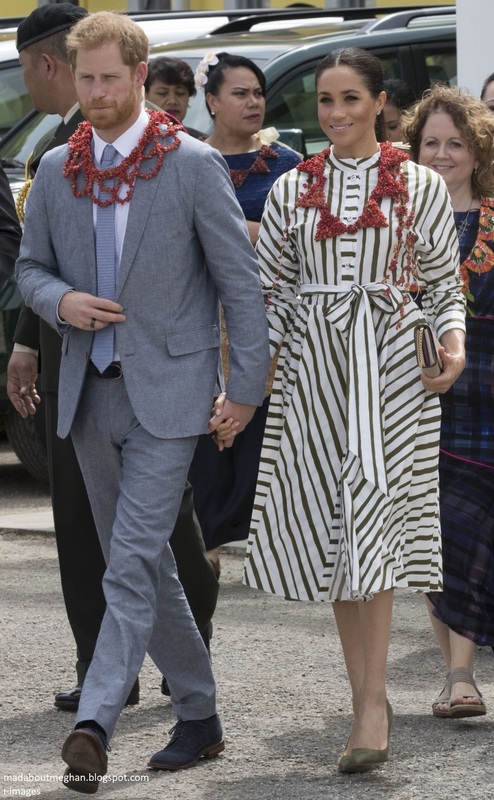 He decided to make a pasta necklace for Meghan. The Duchess was decidedly impressed with the creation. 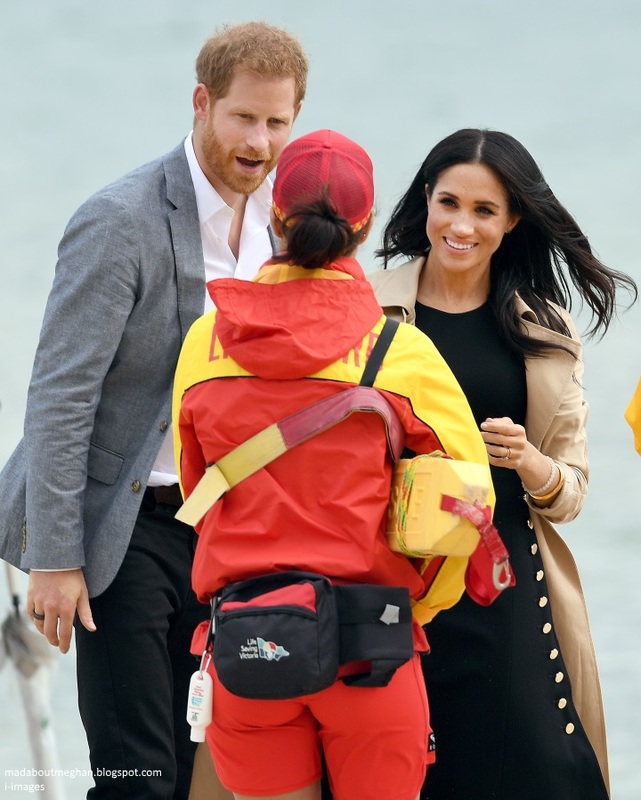 The couple met volunteers from a local beach patrol programme, and engagements focused on the environment, a key area of focus throughout the itinerary. 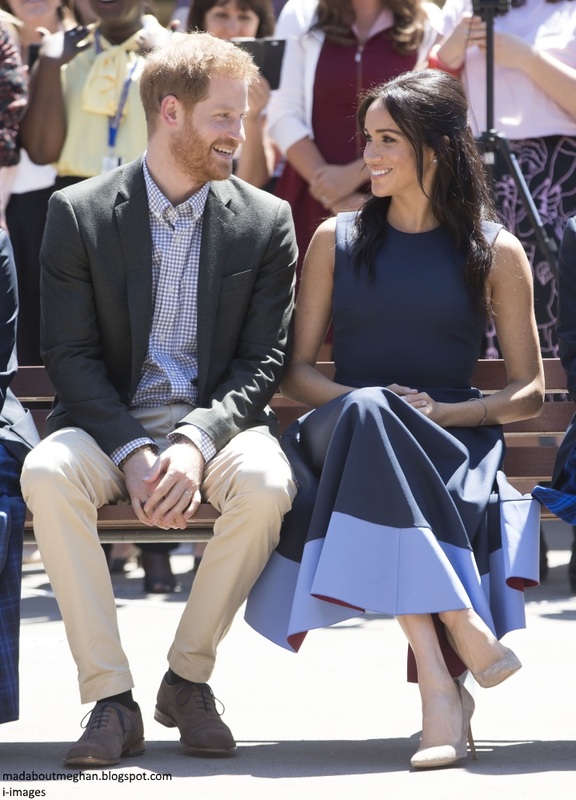 Meghan chose several sustainable brands during the tour including a pair of Rothy's flat shoes made from recycled plastic bottles. Meghan opted for a Martin Grant maxi dress for Fluro Friday on Bondi Beach. The Duke and Duchess met a local surfing community group known as OneWave, who raise awareness of mental health and wellbeing in a fun and engaging way. They participated in the "Fluro Friday anti bad vibes" session, where people of all ages share their experiences of mental health issues, and have the opportunity to interact with others and enjoy yoga and surfing. It was fascinating to learn more about the organisation and their fresh approach to tackling mental health. When it comes to seeking support, it is most certainly not a case of one size fits all. That afternoon focused on viewing the work students are doing in human rights and social justice in Sydney. Meghan wore the two-tone Roksanda Athena dress. The versatile choice took her from the school visit to meeting political leaders later that day. The couple unveiled an ANZAC memorial in Hyde Park, kicking off another jam-packed day down under. 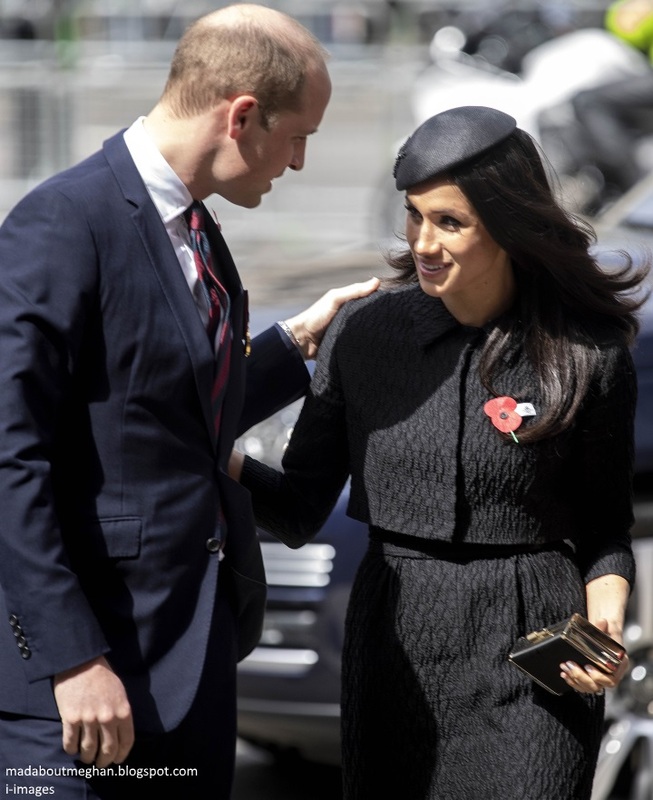 Meghan cut a solemn figure in Emilia Wickstead and a Philip Treacy hat. 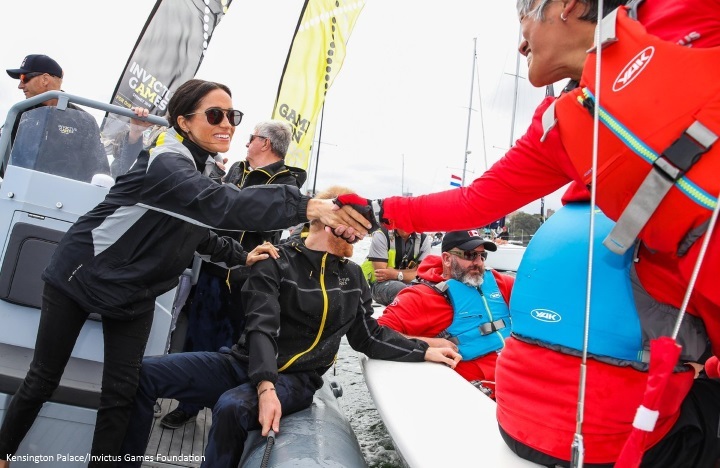 The Duke and Duchess travelled by boat to Cockatoo Island for the Invictus Games Sydney 2018 Jaguar Land Rover Driving Challenge. The event saw the beginning of Invictus events; the games keep getting bigger and bigger each year. The whole event embodied camaraderie, team spirit and bravery. 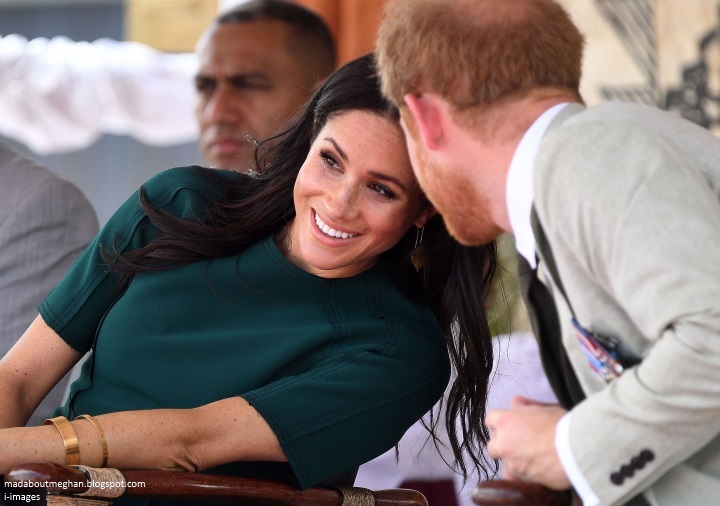 It was a treat when Kensington Palace shared this photo of Meghan watching Harry rehearse his Invictus speech. In a piece for the Standard, Sam Leith summed it up sublimely: "Prince Harry has spent much of his life alone in a crowd - now there is a face looking back at him with love. Imagine the lifetime passed being looked at, imagine the endless sea of strangers’ faces, turned towards you, that will accompany you almost everywhere you go. Talk about being alone in a crowd. And imagine too what, in that lifelong stadium of empty chairs, it would mean to have one face, one particular face, that looks to you from the crowd each time and knows you for yourself." 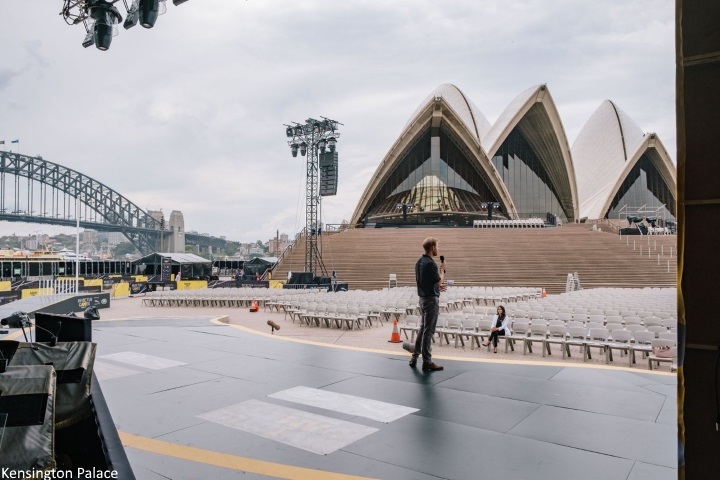 The forecourt of the Sydney Opera House played host to the moving and inspiring Invictus Sydney Opening Ceremony. Meghan sported a Gillian Anderson for Winser London coat and her Stella McCartney cape dress. 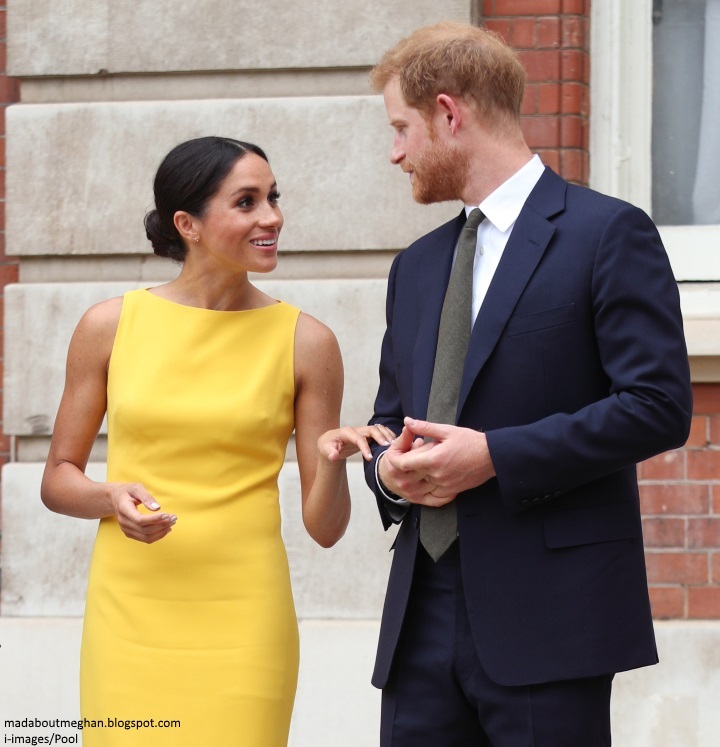 As the hectic tour scheduled continued, the Palace revealed Meghan would sit out a handful of events. An aide told the Telegraph, the Duchess wanted to do everything, but Harry encouraged Meghan to slow down for a couple of days. 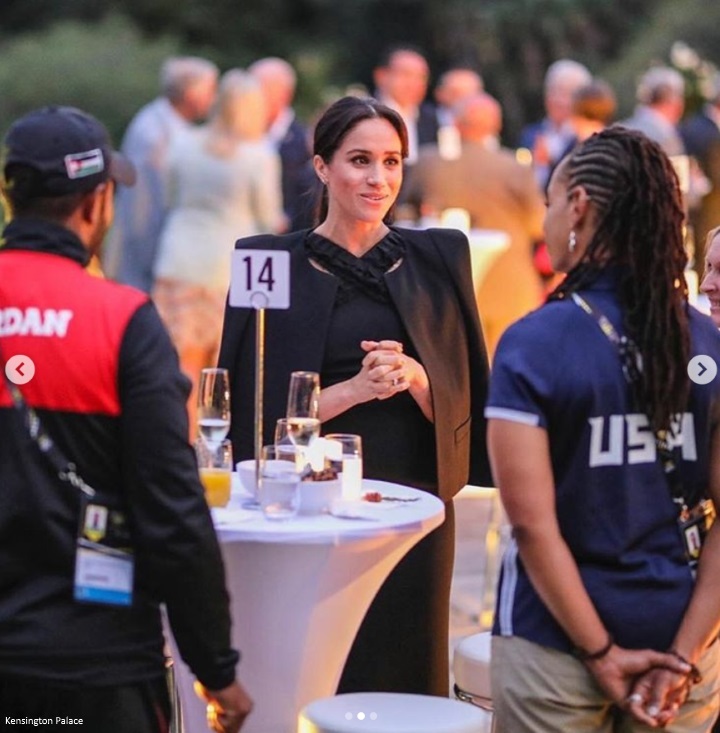 Despite the announcement, Meghan joined Harry for an Invictus reception hours later. Later that day, they took to the water for a sailing event. And that night, the Duchess donned a fabulous Jason Wu number for a private Invictus Games Foundation garden party at Government House. 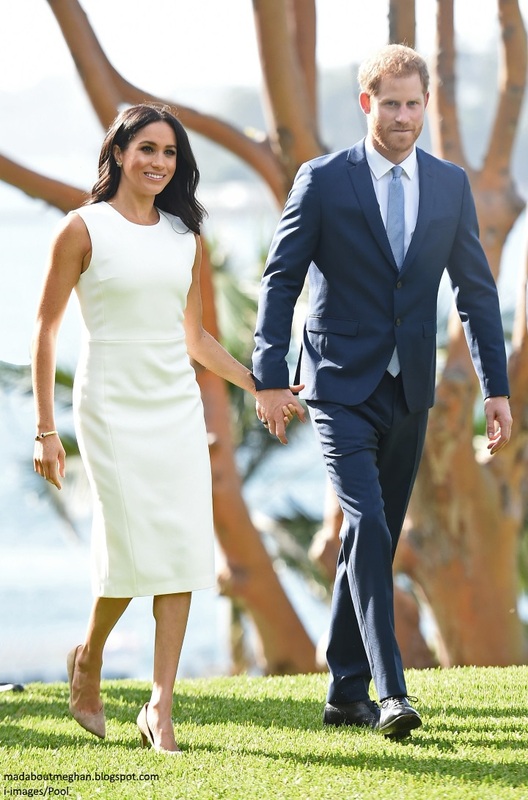 Harry and Meghan travelled to Queensland's Fraser Island. At that point of the tour, readers were very much hoping to see a pop of colour injected into the tour wardrobe. 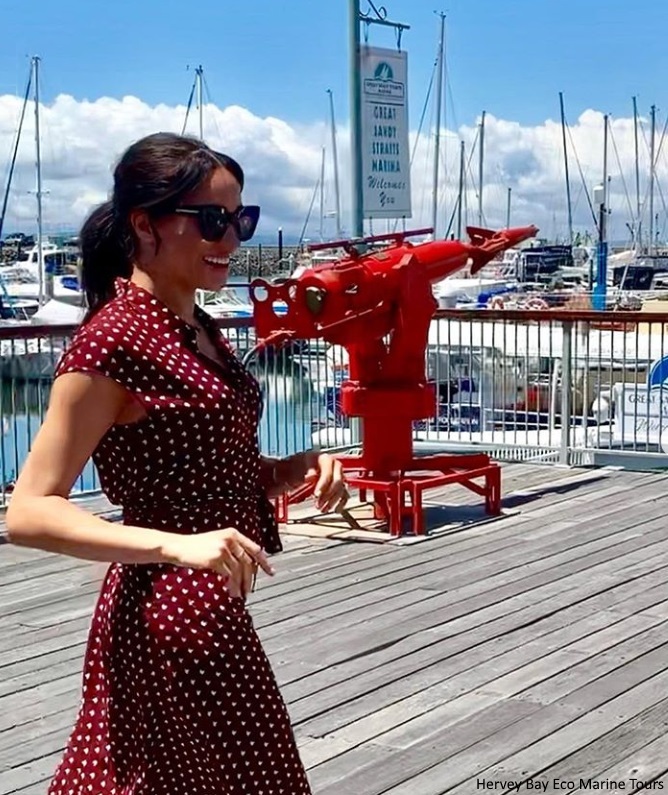 That wish was granted when Meghan arrived at Hervey Bay in a red polka dot midi dress by & Other Stories. 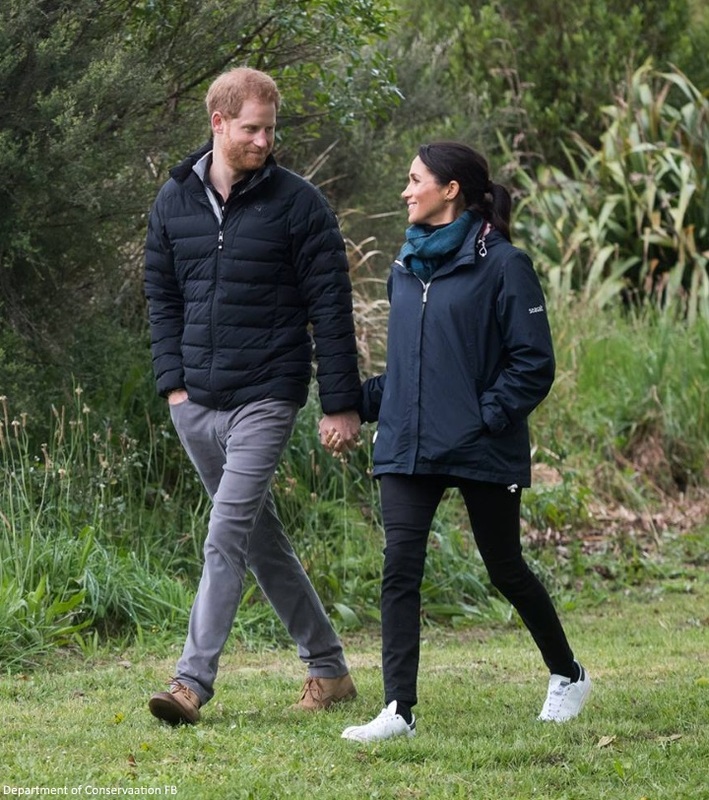 In the afternoon, Meghan rejoined Harry for a walk on the picturesque Kingfisher Bay Jetty. The couple had the opportunity to meet two outstanding paramedics. 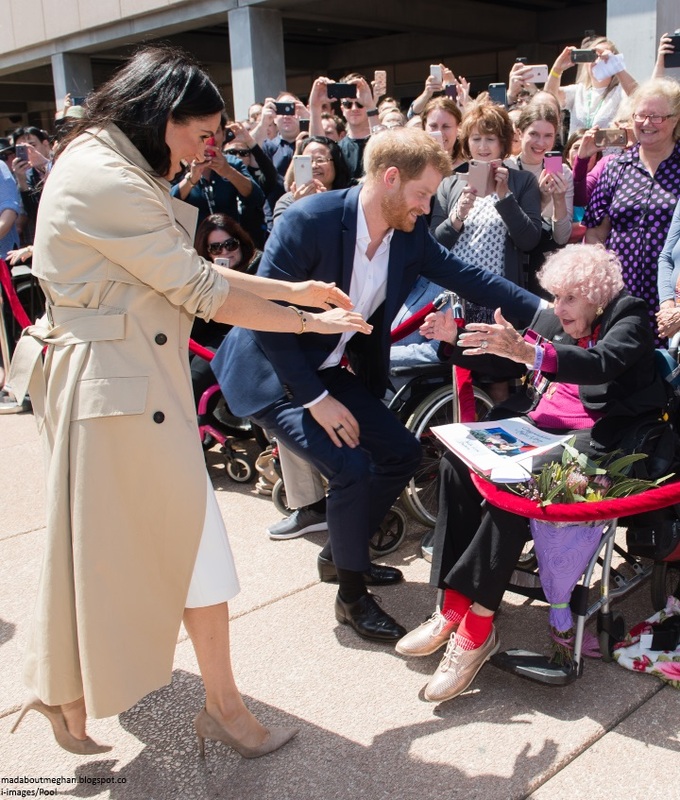 9 News reported: "Prince Harry and wife Meghan have met with hero Harvey Bay paramedics Graeme Cooper and Danielle Kellam who were behind the touching moment when a woman, Joyce, was wheeled on a stretcher to take a last look at the ocean days before her death. The moment came about when the pair picked up the palliative care patient from her home to be taken to hospital. A week earlier, the same paramedic and patient transport officer had been tasked with taking Joyce home from hospital to spend her final days with family, and during that trip Joyce had spoken of her love of the ocean and the romantic memories she had shared with her husband on the beaches of Hervey Bay. The conversation touched them so much, that when they were instructed to take her back to hospital, they decided to take a detour." From there, it was time for the next leg of the tour in Fiji. Meghan resumed a full schedule of duties on arrival. The day saw the couple meeting the president of Fiji before an official welcoming ceremony in the city centre's Albert Park. The ceremony, known as the Veirqaraqaravi Vakavanua, embodies Fijian cultural identity and heritage, and mirrored in format that of the one attended by the Queen and the Duke of Edinburgh in 1953. Indeed, much of Harry and Meghan's itinerary saw the couple retracing Her Majesty's footsteps and continuing to strengthen links the monarch made over her lifetime. 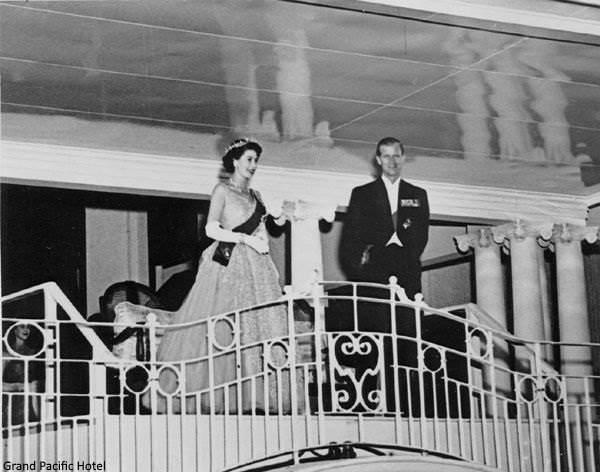 This was especially evident as they appeared on the balcony of the Grand Pacific Hotel. Meghan was every inch the dazzling Duchess in a Fijian blue cape gown by Safiyaa and statement earrings for a reception and State dinner with officials and dignitaries. It marked the first occasion Meghan had worn a gown since becoming a member of the Royal family. It was a beautiful choice and a nice touch of sartorial diplomacy. The Sussexes visited the University of the South Pacific campus in Suva. Meghan took to the stage to announce two new grants awarded to the University, allowing them to run workshops to empower female staff and to support students during their education. They will be provided by Her Majesty's patronage, the Association of Commonwealth Countries. In a personal speech Meghan drew on her own experiences, acknowledging the joys and challenges of her own journey at Northwestern in Chicago where she graduated in 2003 with a double major in theatre and international studies. "I am fully aware of the challenges of being able to afford this level of schooling for many people around the world - myself included. It was through scholarships, financial aid programmes and work-study where my earnings from a job on campus went directly towards my tuition - that I was able to attend university,' she said. And, without question, it was worth every effort. Everyone should be afforded the opportunity to receive the education they want, but more importantly the education they have the right to receive. And for women and girls in developing countries, this is vital." 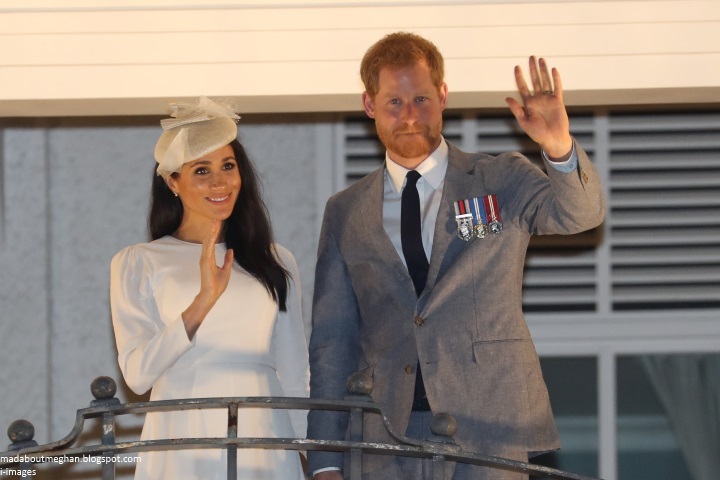 For their final engagement in Fiji, the Duke and Duchess of Sussex visited the city of Nadi in Western Fiji, where they attended a special event at Nadi Airport. Following a departure ceremony, they unveiled a new statue commemorating Sergeant Talaiasi Labalaba, a British-Fijian soldier who lost his life in the 1972 Battle of Mirbat. Meghan wore a green Jason Wu dress. I'm usually a fan of the designer, but I thought the fit on the shoulders of this dress was quite poor. 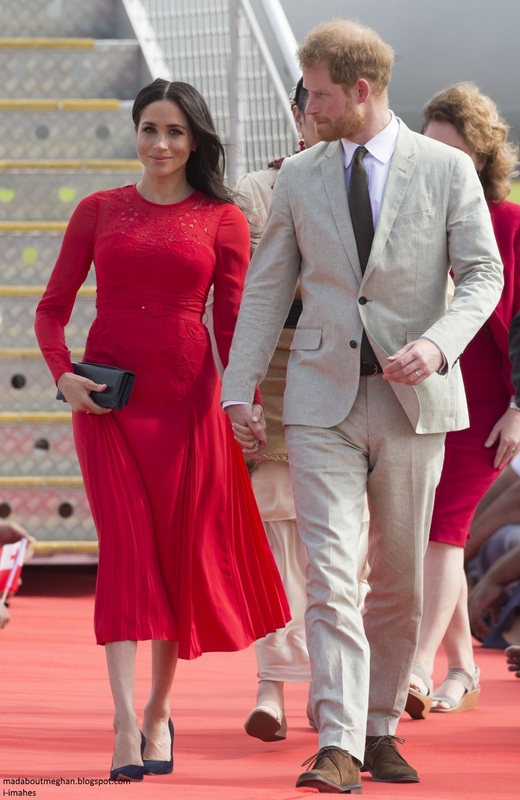 The Duchess sported a Tongan red dress by Self-Portrait as they kicked off the next leg of the tour. The first day in Tonga concluded with a glamorous reception and official dinner at Consular House. Meghan chose a striking white Theia gown for the night teamed with Diana's Aquamarine ring. It was a Martin Green olive shirtdress the next morning in Tonga for meetings and engagements. 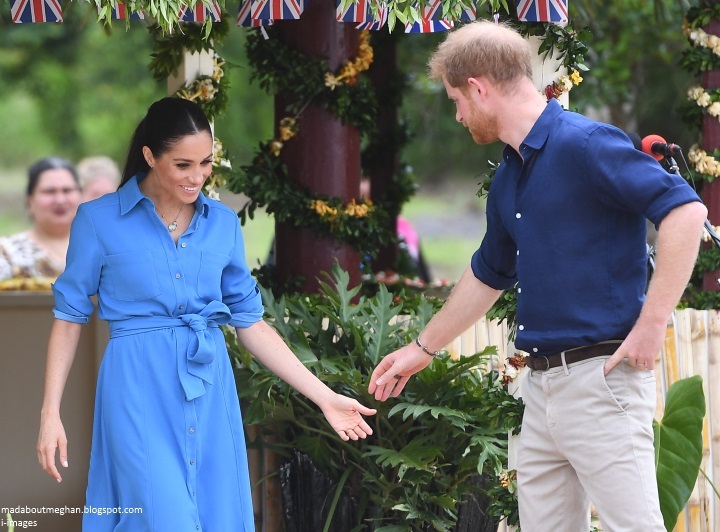 Meghan changed into a vibrant blue Veronica Beard dress for a memorable visit to Tupou College, the oldest secondary school in the Pacific. The Duke and Duchess were there to dedicate two forest reserves at the school's on-site forest - the Toloa Forest Reserve, the last remaining forest area on Tonga’s main island of Tongatabu, and the Eua National Park Forest Reserve, located at the Island of Eua – to the Queen's Commonwealth Canopy. The Duchess was in fits of laughter as students performed a song to deter mosquitoes. Following a return to Sydney for the Australian Geographic Society Awards, it was time for THE look of the tour: a stunning Oscar de la Renta white tulle dress with black bonded, looped ribbon, tweed laser cut birds. This is one I hope we see at least once more publicly. I love this look, and it might be my favourite piece Meghan has worn to date. The following day it was time for the wheelchair basketball finals - the final sporting event of Invictus Sydney. At the closing ceremony, Meghan delivered a speech praising the Invictus family and revealing her own private visits to military bases before she joined the Royal family: "I’m not sure if many of you know this, but a few years ago, before I had met my husband, I had the incredible honour of visiting troops deployed all over the world; from the UK to Italy and Afghanistan, and several other countries. In travelling to these military bases, I was given a very special glimpse into the lives of those who serve our countries." 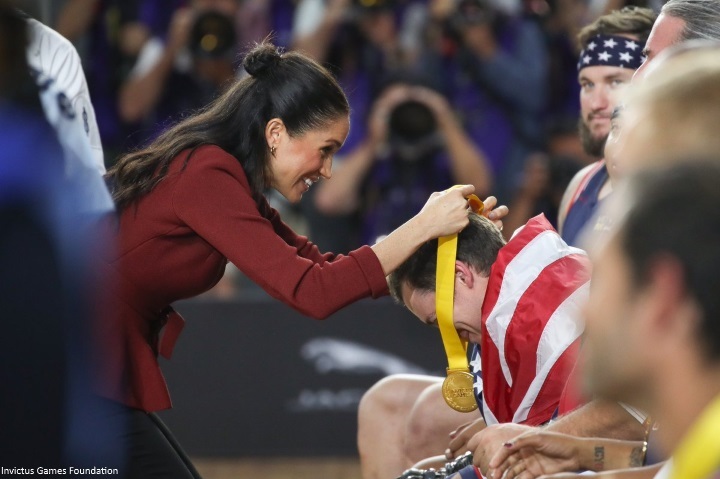 Meghan added: "The support system on the ground here at Invictus is something unlike any other, because it’s not just cheering on your own, but realising that by the end of this week 'your own' becomes everyone in the Invictus family." Meghan is now a fully fledged member of the family too. ...and hello to New Zealand! The Duke and Duchess of Sussex concluded their first day in New Zealand with a reception hosted by the Governor-General celebrating the 125th anniversary of women’s suffrage in New Zealand. Meghan, in Oscar de la Renta, delivered a powerful speech: "In looking forward to this very special occasion, I reflected on the importance of this achievement, but also the larger impact of what this symbolises. Because Yes - women's suffrage is about feminism, but feminism is about fairness." Meghan wrote her own speeches for the tour and according to reporters undertook arduous research in preparation. The Duke and Duchess kicked off their second day in New Zealand with a visit to one of Wellington’s most iconic cafes, Maranui. During a discussion with youth group representatives Meghan shared her views and experiences on social media: "Young people find it so difficult. You see photos on social media and you don’t know whether she’s born with it or maybe it’s a filter. Your judgement of your sense of self worth becomes really skewed when it’s all based on likes." As they left, a group of adorable children were waiting outside to see the couple and Meghan ran back into the cafe to ask if a plate of cakes left for her and Harry could be given to them. The couple enjoyed a peaceful walk as they visited Abel Tasman National Park. The day ended with a creative arts reception in Wellington. Meghan chose an ethically made dress by New Zealand-based designer Maggie Marilyn. The talking point of the look stemmed from a new pair of earrings the Duchess had been wearing throughout her time in New Zealand. As it turned out, they were a gift from Prime Minister of New Zealand Jacinda Ardern. 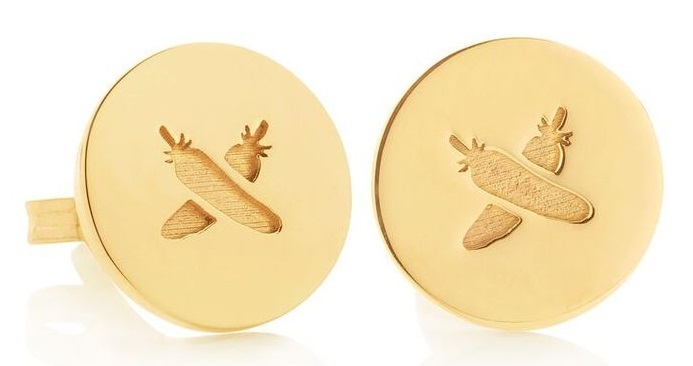 The Boh Runga gold discologo stud earrings feature the native Miromiro feather, reworked into a kiss motif. In Māori mythology the Miromiro feather was a magic token of devotion that would bring loved ones back to you. The earrings are described as being "for the sister with a brave and bold streak". The two got along famously during the visit. When Meghan delivered her speech at the women's suffrage reception, the Prime Minister walked up to her, smiled and said: "Perfect." 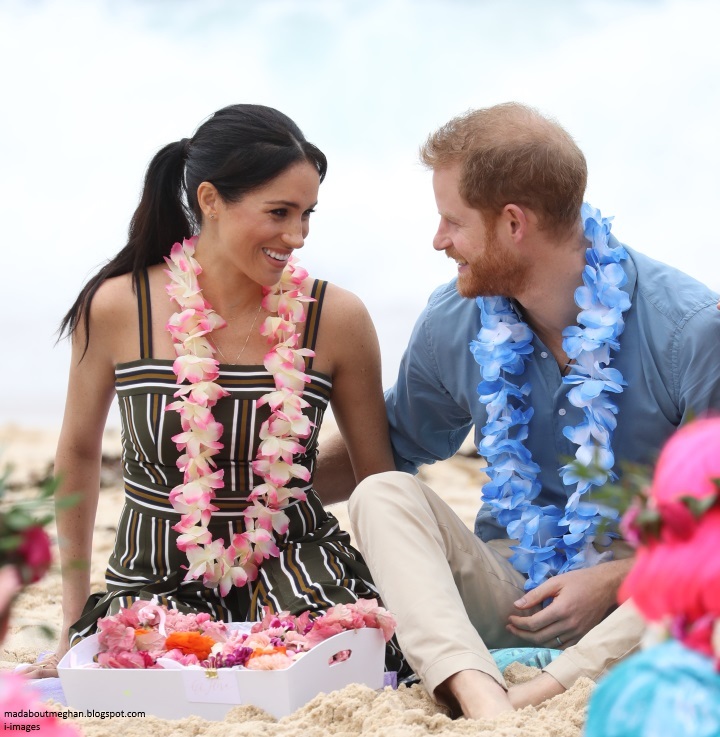 On the penultimate day of the tour, Harry and Meghan visited the North Shore to dedicate a twenty hectare area of native bush to the Queen’s Commonwealth Canopy. The event was organised by the QEII National Trust - the New Zealand link to the QCC. Their mission is to partner with landowners to protect special places on private land for the benefit of present and future generations. They enjoyed a spot of Welly Wanging on the rainy morning. 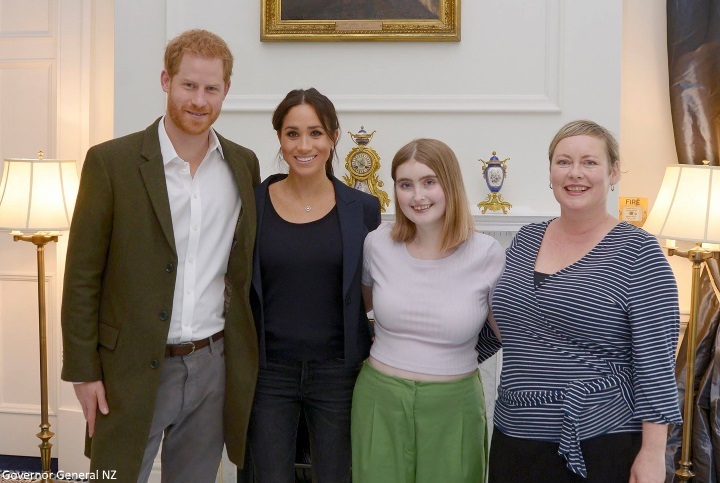 Harry and Meghan had the privilege of meeting Eva McGauley. 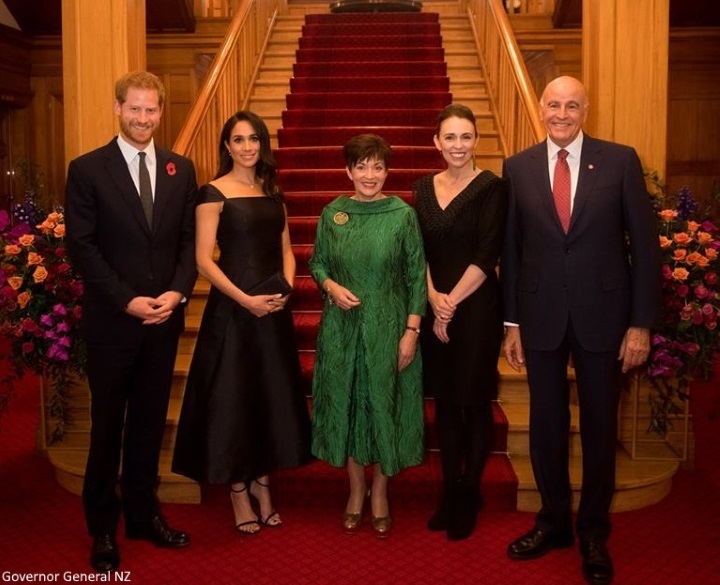 Wellingtonian Eva was invited to attend the Prime Minister's Reception with the Duke and Duchess of Sussex in Auckland. Unfortunately doctors orders meant Eva was unable to fly. When the Royal couple heard her story, they invited her for a quick catch-up at Government House instead. Eva was diagnosed with cancer in late 2015. She was determined to live her life to the full and launched Eva's Wish to support people affected by sexual violence. 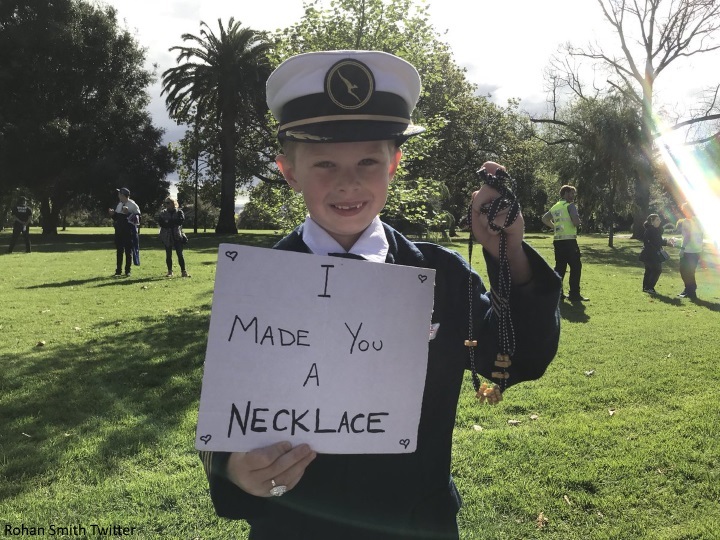 Eva's Wish raised $65,000 for initiatives in New Zealand. I was terribly sorry to hear Eva lost her battle with nasopharyngeal carcinoma, a rare type of head and neck cancer, in November. Throughout her illness, Eva focused on supporting others and used her voice to champion vulnerable women. She embodied selflessness and courage. New Zealand sexual violence survivor advocate Louise Nicholas said: "She said she looked upon me as a hero; she will always be mine." The Duke and Duchess joined the Prime Minister to visit Pillars, a charity operating across New Zealand that supports children who have a parent in prison through the provision of special mentoring schemes. 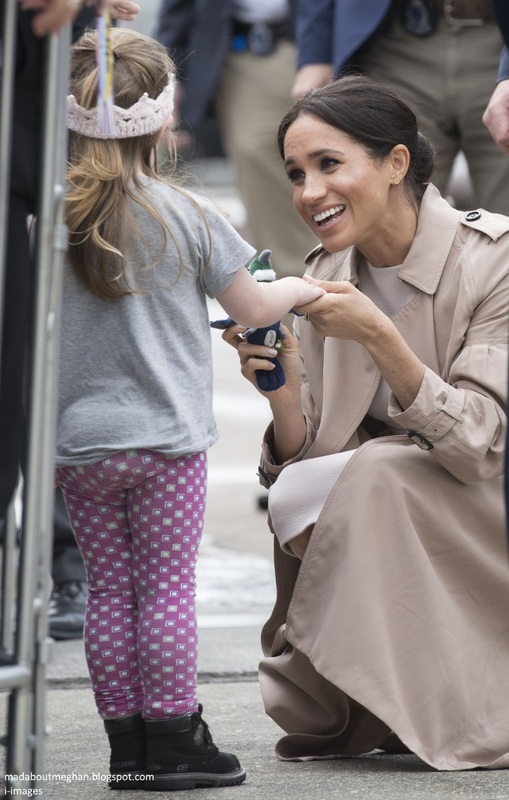 During a walkabout afterwards, Meghan met an adorable little girl called Zoe who gave her a toy for Baby Sussex. Meghan asked her name and her mum replied: "Zoe." She then looked at the toy and said: "I'm going to name it Zoe. Thank you so much. I love it." Meghan ran into a familiar face. 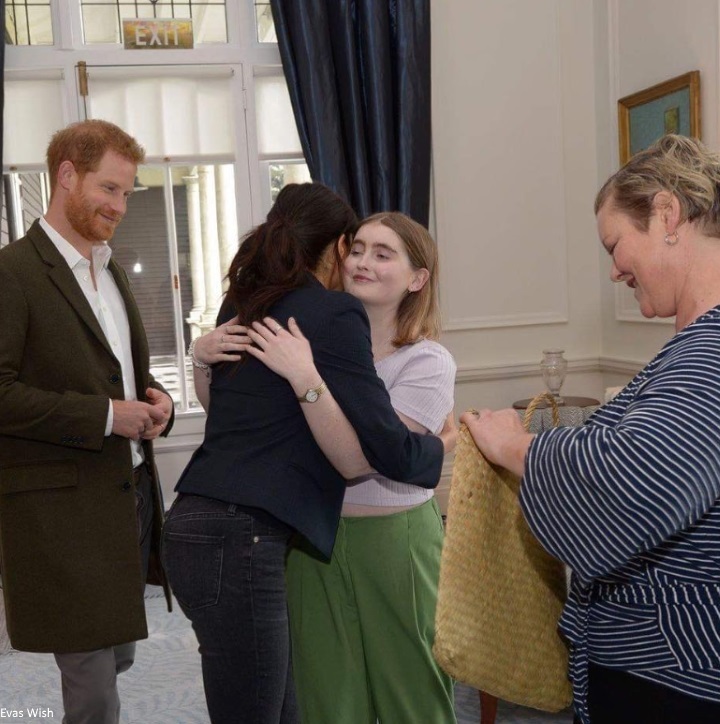 When the Duchess was active on Instagram she supported a number of young women including Hannah. "She would tell me to do well at university and encourage me to be myself," Hannah said of their messages. Hannah gave Meghan a letter which she promised to read. The smile on the Prime Minister's face aptly sums up the moment. 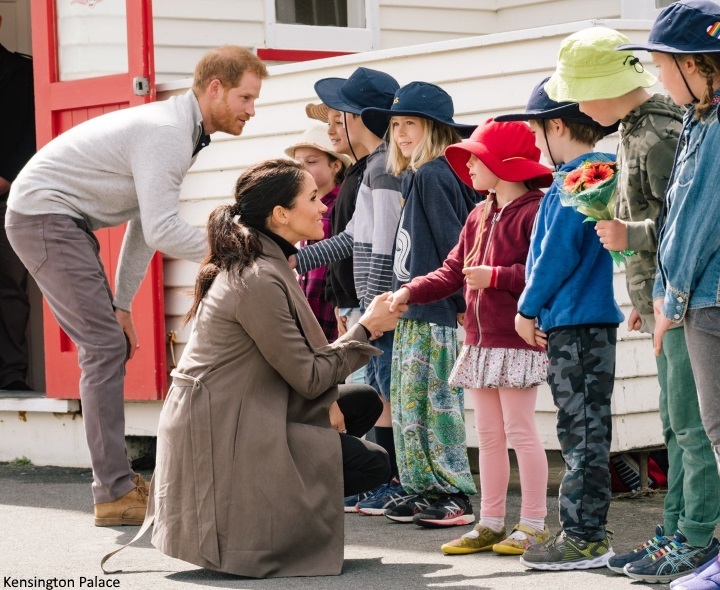 For the final day of their royal tour, the Duke and Duchess travelled to Rotorua, a town set on Lake Rotorua, renowned for its geothermal activity and Maori culture. 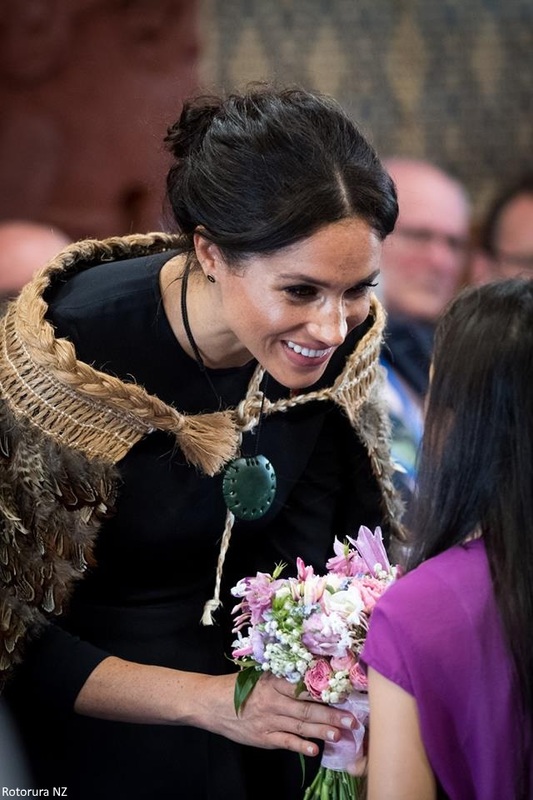 Meghan was given a woven Korowai (Māori cloak) which acts a protector enveloping her in strength, warmth and love - gifted to aid her pregnancy. 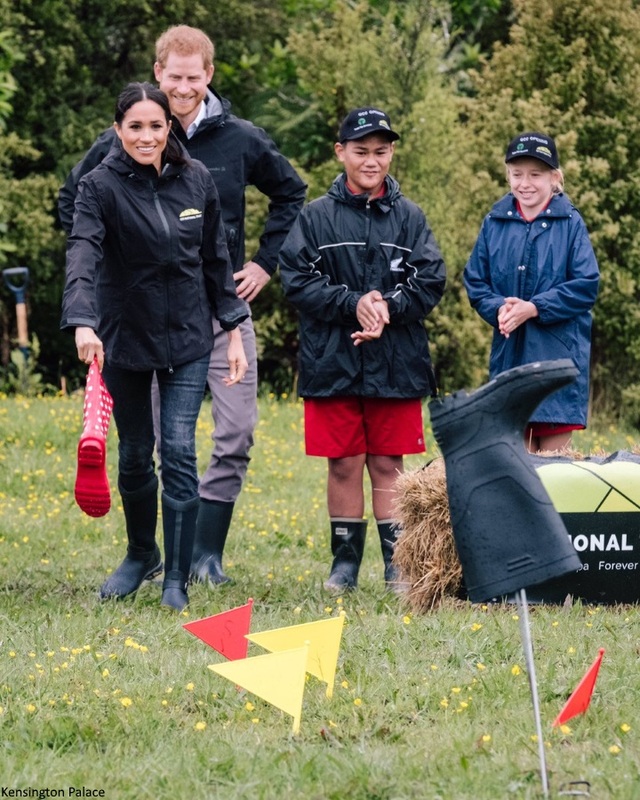 Te Arawa spokesperson Sir Toby Curtis said the royal couple's visit to Rotorua was of huge importance to the iwi and Māori. "The Duchess is a role model for Maōri. She has shown you can succeed, make a difference and be your own person while also celebrating your heritage. This inspires us all." Earlier in the post, I wrote this was a tour about moments and connections. The success of the tour at each and every stop in all four countries is a testament to the warmth and personable approach Harry and Meghan displayed on each of the sixteen days. 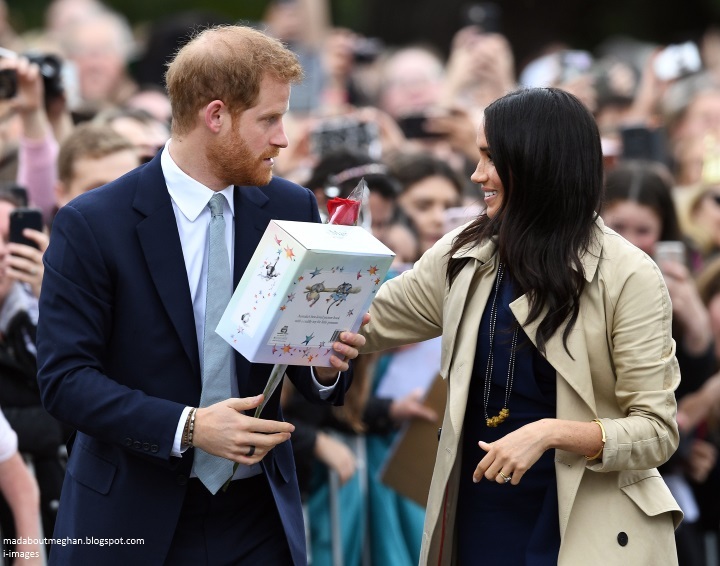 Media in four countries led with 'Meg Mania' and 'Royal Fever' as the couple achieved their goal of representing the monarchy with aplomb, solidifying ties, beginning their own relationships with Commonwealth countries and making as many memories as possible. When she grows up, I suspect Catalina Rivera will smile as she looks at photos of the day she ran through the barriers, held Meghan's hand as she did a little dance and hugged a princess. Perhaps someday she'll bring her own child to meet a visiting royal. And the tour ended with a walk in Redwoods Treewalk Rotorua. As they left, Harry turned to waiting media and said: "It's been great." 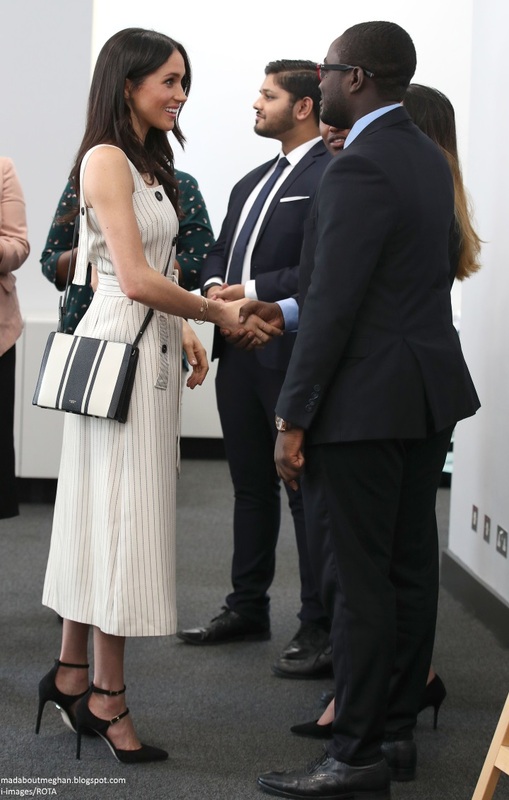 In December, the Duchess joined university leaders, academics and international scholarship students for an event hosted by the Association of Commonwealth Universities at King's College London to discuss higher education opportunities for young people all over the world. 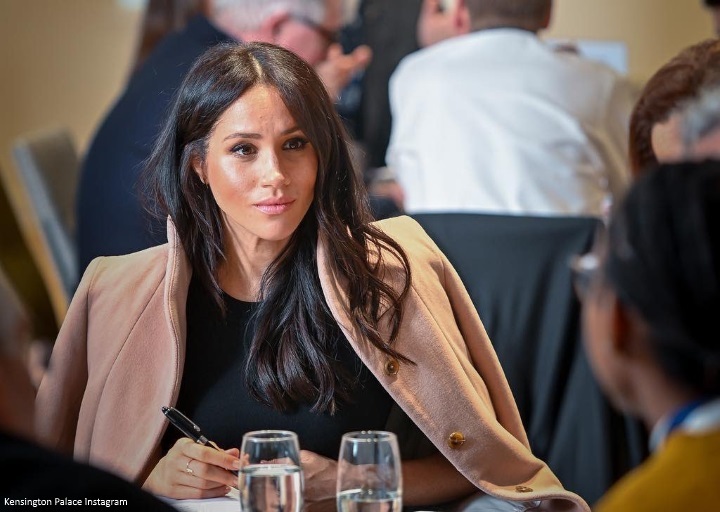 Before the royals decamped to Sandringham for Christmas, Harry and Meghan attended a private board meeting for the Queen's Commonwealth Trust. It's been so interesting to look back on Meghan's first year; from pre-wedding events to a non-stop tour and to see the bonds she and Harry are forging at home and abroad in support of the Commonwealth. There's also chatter of a Canada and US tour with Baby Sussex in tow for the autumn. In Part Two of our review we'll be looking at the remainder of the year's events. What a first year. It has been eventful, for sure. Let’s hope 2019 goes smoothly for Meghan and Harry and doesn’t have the drama and bad press stories this past year has had. That being said, I look forward to seeing what patronages Meghan will have besides the National Theatre. Wow, what a year! I’ve loved watching this professional and passionate woman grow into this role while also defining it for herself. She has renewed my interest in the RF. Can’t wait to see what 2019 brings. Thanks for the post, must have been quite an effort and I appreciate it. You lucky thing! She’s even prettier in real life, isn’t she? What a nice and unexpected look back in closing the year as we begin our travels with the Duke and Duchess in 2019. Simply put, Meghan is lovely and as a team she and Harry are groundbreaking in my opinion. Absolutely agree with you! They have, as a team, this rare quality of making others shine; each other, children, whoever they meet. Top class ambassadors! WOW, Meghan is such a star, I hope that she continues to shine, and does not let the media negativity affect her one little bit. I wish her and Harry another successful and happy year in 2019, with a new home and baby on the way. The photo with Meghan and William showing mutual respect and admiration for each other is a particularly positive one. It makes me wonder where the whole "family feud" rumour originated from. I had the exact same thought, Royal watcher. In the photo of Meghan in the green Brandon Maxwell shirt dress, she reminds me of Julia Roberts! My favourite fashion moments from the tour were the Fijian blue Safiyaa gown & the Tongan red Self-Portrait dress. I think I prefer Meghan in bright colours rather than neutrals. I was lucky to get a glimpse of the couple when they visited Auckland. It was such a whirlwind of a tour, but I think they made a lasting impression on all four countries & the people, charities & organisations they met. We couldn’t ask for better ambassadors to the Commonwealth. Haha, I’m glad I’m not the only one! I thought there was an uncanny likeness...something in the way she smiles & her eyes. Thanks for such a happy trip down memory lane! It's been a wild and wonderful ride with these two kids, and I wish them all the best for 2019. :) Hope you are feeling better, Charlotte. Thank you, Charlotte, for such a comprehensive summary of the year--looking forward with great anticipation to all that 2019 holds for Meghan! As far as fashion, I'm still hunting those intricate large pearl (and maybe opal) earrings she wore briefly toward the end of the tour. I love love love her colorful clothes but find myself navigating back to her in black or her special navy. She just looks amazing. And the best look -- her smile. It is not over-the-top but seems to just radiate pure love. Such an amazing post Charlotte, thank you so much!!! What a year it's been,not only for Harry and Meghan but for us royal watchers! I am struck by Meghan's poise, her ambition, her compassion and her warmth, I've yet to see a married-in royal take on so much in such a short amount of time. This speaks of how Meghan came into this marriage and into this role as a fully formed woman, knowing what she wants to achieve in her life and what she will and will not allow into that life. So often ambitious women are labeled as "difficult" or worse, but what is wrong with wanting a life full of substance, a life full of service to others, a life that one can look back on with pride and sense of fulfillment? Imho, Meghan has taken to this life, this role as though she was born to it, she is regal without being stand-offish, she is poised without being unapproachable, she is just an inspiration. I truly hope that Meghan will continue to shine, as she has, in her new role and in her marriage. The BRF is very lucky to have her. I agree, what she will do in the future work wise is particularly exciting and I am eagerly waiting to see what future projects she will take on and complete. The Together cookbook by the Hubb women was amazing and it shows that with just a splash of creativity and hardwork can make philanthrophy exciting for not only the people working on these projects but also for the people who make donations/contributions to various charities. 100% to everything you said, Lauri!! Thank you Charlotte for all your efforts in keeping us informed in the best of ways about both wonderful Duchesses. What a year Meghan (and Harry!)had. Certainly one of which to be proud. Her joy at truly relating to others comes through in each engagement. I may be an old timer but I love her style, and that she remains true to herself while still considering what's apropos to her new station in life. May 2019 bring continued health happiness and love of service to the Sussexes! I've been waiting patiently for this post. It has certainly been a packed year for the Sussexes. And I have enjoyed every moment of it. The Royal Tour was hugely successful and the highlight of their year. It would be lovely if they had another tour with Baby Sussex in tow. I think Harry and the BRF are very lucky to have Meghan. If you had to design your own princess, you would be hard pressed not to have Meghan pop up. She's pretty and she's a person who gives back to her community. She's very media savvy, yet except for her badly behaving family, she's not had any bad press throughout her career. She has behaved impeccably and you can tell that Harry is soooo happy (and she looks happy too!). What's not to like? I wish the Sussexes all the best for 2019 and here's to getting ready for baby watch soon! Thank you Charlotte for an incredibly long and thoughtful post. Meghan sure has been busy!!! We should all embrace change as well as she has-- "it's a new chapter!" Cheers to her!!! Off topic but I became addicted to Rothys after seeing the Duchess wear them. If anyone wants to try them let me know I can give you a coupon for $20 off your first order. I now own 6-7 pairs. I agree, what a year it has been for the Duchess of Sussex. So much already accomplished and still so much to do. Through it all, I hope she keeps her Sparkle. Thank you, Charlotte. Thank you for such a beautiful look back at the incredible year that belongs to our dear beloved Duchess Meghan. She was a real marvel to watch, a powerful inspiration, a humble and gentle, true and hardworking woman. I drew and continue to draw so much strength from her confidence, generous spirit and strong sense of self. The royals are lucky to have her. I feel deeply and extremely protective of her because I think the world is blessed and better with her in it. I wish Duchess Meghan a safe and healthy delivery, joyful bouncing healthy baby(s) and a lifetime full of love, laughter, peace and a joyous family with Prince Harry. They're the only royals I bother with and Mama Doria ofcourse, a quiet hero with a giant imprint. Thank you for the lovely post, Charlotte!! Looking forward to Part II. Oh Charlotte! You’re incredible, terribly efficient and professional. I love, I love this retrospective you did on the duchesse of Sussex that I love and admire so much. Knowing your passion for your work, I expected this work on Prince Harry’s wife. At first, as I began to look at this retrospective, I thought I would write in my commentary that I preferred such or such photo and part, but in the end the more I continued, the more I liked the whole report: the bottom and the form. Meghan is so beautiful, reactive and effective; she’s such a beautiful couple with Prince Harry. As their name says, it’s the "Success" couple. They give themselves body and soul as much as possible in everything they undertake and do, everything I love. Thank you Charlotte for your superb work and for materializing our admiration for this beautiful young woman and her beautiful couple. Soon they will be filled with a baby Sussex and it is with great pleasure that I will still read your articles about this event and the continuation of their adventures. Happy New Year Charlotte and everyone. I can’t wait to see the second part. I am a man who has never been interested in royal families (apart from Prince Harry, whom I followed from time to time because for me he was almost the only very popular royal to really put Heart into his work) but since Meghan’s spectacular and exceptional arrival in the British royal family, I have subscribed to the life of monarchies. The work you present here, is excellent Charlotte, Meghan is very beautiful and Sussexes are for me the most radiant and charming couple but my favorite moment will remain their wedding as beautiful as symbolic. For me was the most beautiful marriage by the charge of emotions, elegance and originality contained. These two future parents would agree to marry each year, that, they could count on me to fly and come to see the ceremony. What a year. Meghan has definitely pulled very good numbers and shown great dedication to fit into her new role. I am impressed especially as I wasn’t sure if she was able to reach the mark the BRF PR maschine set for her. It was a risky move as she very well might have needed more time to adjust. Well done on her part! Fashion wise, it was rather disappointing to me. Most outfits missed the mark for me and often due to small elements. Especially her hemlines and shoes put me off. I often like the general idea but don’t like the result. Maybe I am too used to the style of her alias Rachel Zane (a style I absolutely adore). That’s how I came to know her and the reality is (sadly) a bit underwhelming. I am excited what 2019 will bring apart from welcoming their child (which is exciting enough). Thank you Charlotte for all of your hard work. I especially appreciate the kindness and empathy shown by your readers to the Duchess. People can be so horribly cruel and they don't even know the real story. Just stirring up dirt for the sake of the almighty dollar or pound, etc. I listen to a radio station in the evening in the states called Delilah. She has people call in and tell stories about love lost and/or found and plays music that has special meaning to their stories. Last night an older gentlemen called in and gave just the best solution for his long lasting marriage. He provided the living and she provided the reason for the living. I think this sums up Harry and Meghan. He seems so happy to have someone who loves him and is willing to live the life he didn't chose but must follow. I wish them both the very best for their lives together. God bless for your hard work! it has been truly a great year and thanks for all your hard work Charlotte. the only black spot on Meghan and Harry's life is the Markle side of the family. With her father who won't shut up and his new book coming out and her awful half brother and sister it must be trying on Meghan! I know it's trying for the general public to listen to them. However when we look back on their great year they had a beautiful wedding and Meghan is fitting in nicely to her role in the royal family with a beautiful baby on the way we can't ask for more. This was so fun to read and reminisce about the past year! Her recent fashion choices were forefront in my mind so this reminder of how stunning her fashion was all year was timely! Praying and hoping it's a lovely year for them and some of these (possible) family wrinkles are ironed out! My second look, Charlotte. This post is so fantastic, I wanted to be sure I didn’t miss anything. Thank you. Excellent!!! Anonymous, I am a fan of the Martin Grant striped maxi dress too, and the Brandon Maxwellgreen shirtdress is lovely on Meghan. I hope she intersperses some color with her chic neutrals again. The blue Safiyaa gown comes to mind. Meghan has impressed me by her hard work as she joined the Royal Family and the many engagements she undertook both privately and publicly. I also applaud her for her grace under pressure from her family. It is unfortunate she has to deal with unwanted comments from her family on top of all the other pressures of becoming a Royal. As far as her fashion goes I would sum it up as minimalist, loves tuxedos, trench coats, neutral colors, and an occasional surprise with a big pop of color! I also love her compassion in dealing with others. Harry found a definite winner! Diana would be so proud!!!! What a year it's been! Long live Harry and Meghan and their precious bundle of joy.